Genomics, Medicine, and Pseudoscience: Does NIH recommend acupuncture? "NIH recommends acupuncture" - that's the headline on a recent web article on an acupuncturists' website. Now, I know that NIH has granted millions of dollars to acupuncture researchers who have tried their best to prove it works, but I didn't think NIH officially endorsed it. For one thing, despite these wasted millions, the best evidence shows that acupuncture doesn't work, not even a little bit. What the article was referring to illustrates the dangers of NIH's far-too-gentle treatment of acupuncture and other "alternative" practices. It also shows how promoters of questionable or downright bogus practices can distort the facts to suit their own ends. What the acupuncturists found was an NIH news site that ran an article called "Understanding acupuncture: time to try it?" (Note the question mark.) The article was written by Harrison Wein, a science writer at NIH who interviewed a handful of researchers, most of them promoters of acupuncture themselves who are funded by NCCAM. "Don’t use acupuncture as a replacement for conventional care"
"Don’t rely on a diagnosis of disease by an acupuncturist who doesn’t have conventional medical training"
"Should you try acupuncture? Studies have found it to be very safe, with few side effects. If you’re thinking about it, talk to your doctor." So no, not an endorsement. Just a much-too-gentle recommendation to talk to your doctor first. The writer (Wein) regurgitates the claims of acupuncture promoters hook, line, and sinker - and he doesn't cite any evidence for his statement that it is "very safe." In fact, acupuncture often causes infections, sometimes serious ones. And as I wrote last month in The Atlantic: in 1995, a 40-year-old Norwegian woman visited an acupuncturist for relief from fibromyalgia. As described in The Lancet, she died two hours later, and an autopsy revealed that the needle had punctured her left ventricle. Think that's just one unfortunate anecdote? Well, in the journal BMJ last year, researchers reported that acupuncture infections are a significant problem worldwide, and that they have been under-reported for years. Infections caused by acupuncturists have led to "joint destruction, multi-organ failure, flesh-eating disease and paralysis" as well as hepatitis B and C and mycobacteriosis. "For example, when researchers have compared inserting needles with just pressing a toothpick onto acupuncture points, they’ve often found both treatments to be successful. But Sherman questions whether these are really controls. Many traditional acupuncturists would consider them true treatments, too. The important thing, in their view, is to hit the right spot, not necessarily how deep you go." So when the evidence doesn't show what she likes, Dr. Sherman changes the definition of placebo. This is called "moving the goalpost," and it's a classic sign of bad science (and a bad scientist). Actually, she goes even further, saying "I don’t really think you can come up with a great placebo needling." In other words, in Dr. Sherman's world, acupuncture can't really be tested. I guess it's just magic. "… the body contains a delicate balance of 2 opposing and inseparable forces: yin and yang. Yin represents the cold, slow or passive principle. Yang represents the hot, excited or active principle. Health is achieved through balancing the 2. Disease comes from an imbalance that leads to a blockage in the flow of qi—the vital energy or life force thought to regulate your spiritual, emotional, mental and physical health. 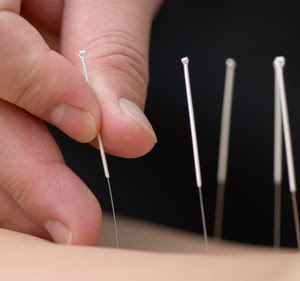 Acupuncture is intended to remove blockages in the flow of qi and restore and maintain health." I want to laugh at this, but it appears on an honest-to-goodness NIH website. As my colleagues at Science-Based Medicine put it, "acupuncture is a pre-scientific superstition." It does not deserve our respect, nor should we take it seriously. There's no scientific evidence whatsoever that "the flow of qi" has any physiological basis. The passage above should have been followed with a bit of real information, such as: "Scientifically, there is no more evidence for qi than there is for the tooth fairy or Santa Claus. However, some researchers argue that Santa Claus is quite a bit more plausible." But that would perhaps be hoping for too much backbone from NIH. Note to NIH: don't give pseudoscientists the imprimatur of legitimacy by repeating their claims. And pay better attention to what you allow on your website. What would be the mechanism for shutting down NCCAM? Could Francis Collins do it (ignoring his own fascination with scientifically dubious things like Biologos for a moment)? Or would it take an act of Congress? Great question. Unfortunately it would require an act of Congress. Former NIH director Harold Varmus tried to limit the activities of NCCAM - to make them more science-based - and Congress responded by increasing the NCCAM budget and taking it out of the Director's control. Varmus' recent autobiography tells the tale. Now let me ask you this question: Do you think that hospital caused infections are a serious problem? Do you think you should warn people about those infections? Do you think hospital caused infections kill people? Anon: of course hospital-caused infections are a serious problem - a huge one. Hospitals should be taking much more aggressive steps to control them, and a number of examples show that it is possible to reduce these infections dramatically. However, the structure of your comment indicates that you think acupuncture should be given a free pass on infections because hospitals have an infection problem too. Nope. That's a classic "two wrongs make a right" argument, and it's not valid. Plus, there's the major difference that hospitals offer genuinely effective treatments, at least sometimes. Acupuncture does not. It's all risk and no benefit. Perhaps you have 2 standards Steven. One for "orthodox medicine" and one for what you consider "alternative" medicine. Let me ask you this: in your life, have you ever mentioned the danger of hospital caused infections or ever criticized the medical industry for such infections. two, is it possible that you you think hospitals should be given a free pass on infections ? If the second is untrue, tell me when you have ever commented on it. By the way, if you think that refuting an argument that has not been made (ie accupuncture should be given a free pass on infections) is evidence for your position, I think you may be incorrect. I wish more people could hear this side. It seems to be drowned out by proponents. I can't believe I'm the minority in any group when it comes to acupuncture, chiropractic, cupping, etc...I have a chronic illness and it makes me genuinely angry when I see people selling this idea to fellow sufferers.